The upcoming 3DS version of Super Street Fighter IV allows players to fight in a completely different way. The 3DS's extra power is allowing titles like Super Street Fighter IV to soon be in the palms of our hands, but in the case of the Capcom fighting franchise it might also be encouraging its developers to provide a totally new look at Street Fighter's traditionally side-view action. Andriasang translates a hands-on preview of Super Street Fighter IV: 3D Edition from Japanese gaming site 4gamer that reportedly reveals a brand new behind-the-shoulder fighting view. Capcom previously said that it was trying to figure out how to utilize the 3DS's capabilities, so this new view mode may be part of what Capcom came up with. SSFIV: 3D apparently asks players if they want to turn 3D on or off when the game starts, and if they choose to turn it on the game switches to a view from behind their character's shoulder. "It's like a different game," the previewer wrote. 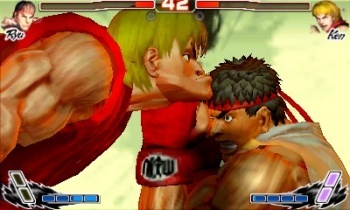 The game plays the same way through the new view, including the execution of moves such as Ryu's hadouken, but the camera constantly sticks to the character's back. Though it sounds awkward to play Street Fighter this way, the previewer seemed to enjoy it. This is a fairly significant addition to the Street Fighter franchise, so for the new camera mode to be exposed without Capcom talking about it at all is strange. It might not be an official feature yet, it could have been unlocked in the previewer's copy by mistake, or a PR representative might have forgotten to tell the previewer what the deal was. For now, behind-the-shoulder in Super Street Fighter IV: 3D Edition will remain an unofficial feature until confirmation by more sources. [Update] Well, the new mode has been officially revealed. The following video shows the new mode in action, and while the viewpoint isn't quite what I was expecting, it's definitely something different. Thanks kevo.mf.last for the video link!